I have always loved mincemeat - pie with vanilla ice cream or cookies and cocoa. This is how we make them, except here I will substitute Borden's Nonesuch Mincemeat, or Robertson's (preferred) in a jar instead of homemade mincemeat. You can substitute your favorite shortening (vegetable works great) while I will use rendered leaf lard. 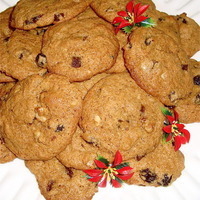 This is a superb mid-winter cookie, and has lots of nutrition and energy because mincemeat is loaded with minced apples and raisins and great spices. A real treat after skiing, snowmobiling or just hiking through the snowy woods. These Look great. Would make a wonderful breakfast cookie!...especially at this moment. I see rendered "leaf lard", which I have to admit I am not familiar with. I hope to have some time between Christmas and New Years to try them. Leaf lard is obtained from the area around the kidneys of the animal, and considered the 'best' quality lard. I use lard from the Mangalitsa (MON-go-leet-sa) breed of swine, which was created in 1833 by the Hungarian Royal Archduke Jozsef. Until around 1930, this was THE shortening use for quality baking. Unlike all popular breeds of hogs, which are meat-type, the Mangalitsa is an extreme lard-type breed. Mangalitsa fat is more unsaturated than normal pig fat, so it tastes much "lighter", "cleaner" and melts at a lower temperature. The fat is also healthier and keeps longer, due to higher levels of oleic acid. In fact, this particular lard is 'healthier' than butter due to the low saturated fat content. Not too well known yet in the USA, this unique breed will grow in popularity. The meat is lean and well-marbled, and has a bit bolder flavor, reminds me somewhat of Italian boar. I use unsalted butter or this lard in anything I bake. Let me know if you want to acquire some. This sounds terrific. I love mincemeat and am upset that it is only "acceptable" as pie during the Thanksgiving/Christmas holiday season. With this recipe I will be keeping my love of fruit, nuts, and spices going all year. Thank you. I will post a home-made recipe for mincemeat. I will look for it! Is the homemade version available on here from you? I'd love to try it homemade as well! I have yet to try mincemeat Amos. These sound delish! The recipe doesn't state when or if you add the mincemeat. Am I missing something?? ?